As the Dutch have always been roaming the seas, many of the captains, the owners of the shipping companies and other related (and wealthy) figures, often wanted to have their vessels shown on the tile murals in their home. 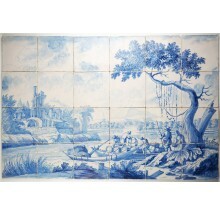 Thanks to them the Dutch have inherited many wonderful nautical tile murals, but many of them are not available for sale as they are highly collectible. Fortunately, our path does cross some of them occasionally. Those can be found here, available and prepared for restoration or interior design projects. If you have any questions about our antique Dutch tile murals depicting ships, boats or other related scenes, or if you are looking for something specifc, please do not hesitate to contact us. Click here to visit our contact page.